The FZ802/FZ800 is Panasonic’s latest mid-range OLED TV and takes image accuracy to the next level thanks to second generation Studio Colour HCX processing. In addition to the picture quality, a minimalist design, simple but effective smart platform, decent sound, and competitive price all combine to create a very tempting package. More than any other manufacturer, Panasonic has prided itself on the accuracy of its TV images. The company has a long history of making professional studio monitors, and its consumer OLED TVs are used by a number of Hollywood post-production facilities as large screen monitors. Panasonic's 2018 OLED TV range is headed up by the flagship FZ952/FZ950, which includes the second-generation Studio Colour HCX processor and a new Dynamic Blade soundbar that's tuned by Technics. However, if you don't want the soundbar, the mid-range FZ802 reviewed here (it's the FZ800 in other territories, but the same TV) offers identical picture quality at a very competitive price, making it an attractive alternative. The Panasonic FZ802 could never be considered flashy, but that largely reflects the TV's studio monitor heritage. Why bother with eye-catching bezels and stands, when the most important aspect is image quality? Since the FZ802/FZ800 uses an OLED panel, it is mere millimetres at the top but deeper at the bottom where the electronics and speakers are housed. There's no bezel, just a dark metal trim around the outer edge, finished in a minimalist black. It's a largely metal construction that suggests a pleasing level of robustness, with only the back panel using textured plastic for its lower bottom half. The matching black stand is also metal and uses a traditional design that is both attractive and practical. It provides solid support and is more likely to fit onto smaller equipment stands than TVs that use feet or a full-width soundbar. There's also the option to wall-mount this telly using a VESA bracket. The FZ802 uses a panel provided by LG Display, as does every other OLED TV on the market. That means you get those deep blacks, wide viewing angles and pixel-level precision that makes OLED look so good. It also means that what really differentiates one brand from another is the processing going on behind the scenes. The FZ802/FZ800 is built around the second-generation of Panasonic's Studio Colour HCX processor, which the company developed in conjunction with Hollywood filmmakers. It's designed to deliver the most accurate images possible, thanks to the use of professional 3D look-up tables (LUTs). The use of these sophisticated data tables allows the FZ802 to deliver incredibly accurate colours that cover almost 100 per cent of the cinema DCI-P3 colour space, and render more accurate colours in both the darker and brighter parts of the image. The new Dynamic LUT feature also means that rather than using a single LUT, the HCX processor analyses the image and adjusts the LUT from scene-to-scene. There's also advanced image processing and scaling, which is intended to produce a superior image with lower resolution content, as well as noise reduction features for lower quality sources. The result of all this processing is greater clarity, improved brightness, more precise colours and greater detail; so whatever you're watching, the FZ802 is able to deliver the best possible picture. Panasonic supports HDR10 (an advanced High Dynamic Range system), Hybrid Log-Gamma (HLG) and, via a future firmware update, HDR10+ (you guessed it: an even more advanced system that uses dynamic metadata to adjusts the peak brightness from scene-to-scene, thus improving the HDR image quality). However, the FZ802 does not support Dolby Vision (which is Dolby's own HDR system), which might be an issue for some potential buyers. This year there's a new feature: Dynamic Scene Optimiser. This analyses the HDR image and adjusts the tone mapping according to the content. There's also Auto Brightness Enhancer, which adjusts the picture based on the level of ambient light in the room. While those last two features might cause the picture to deviate from the industry standards, Panasonic's adherence to image fidelity is evidenced by the FZ802's Ultra HD Premium and THX certification. It also includes a comprehensive set of calibration controls certified by the ISF, so a professional calibrator can produce an incredibly accurate picture, either manually or using the auto-calibration features. The FZ802 includes a Game mode that bypasses much of the processing, and can deliver an input lag of just 22ms. That applies whether you're gaming in HD, 4K, SDR or HDR, making the Panasonic a great choice for gamers. If you're a sports fan then there's a dedicated Sports mode with improved motion handling, so you don't miss any of the fast-paced action. There's also black frame insertion, which improves motion by literally inserting a black frame between every frame. While this does help with motion, the added black frames darken the image slightly and some users may experience flicker. 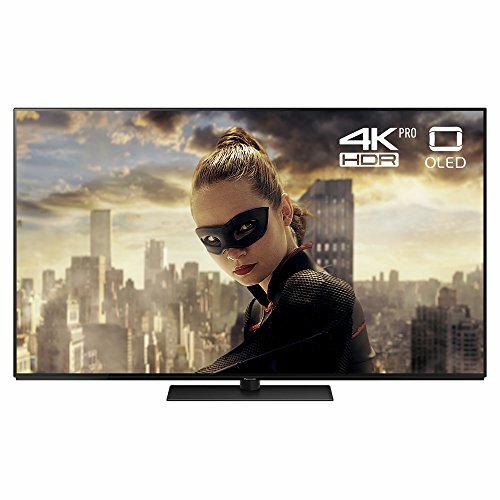 The Panasonic FZ802 certainly delivers in terms of performance, with the best picture quality that we have seen from a Panasonic OLED TV, or any OLED TV for that matter. For a start the 2018 OLED panel is better than earlier iterations. Although this is not directly related to Panasonic because they're made by LG Display, it's good to see an image free of banding or vignetting (dark edges/corners). The picture is clean and uniform, with none of the clouding or dirty screen effect that often plagues LCD TVs. There is also no discolouration or magenta tint, which has been an issue with OLED screens in the past. That just leaves a beautiful picture where the blacks are incredibly deep, with an exceptional contrast performance. Panasonic has worked hard to ensure that its 2018 OLED TVs also retain detail in shadow areas, with plenty of fine gradation as the image comes out of black. There are even additional calibration controls to allow professionals to fine-tune those tricky areas just above black. The colour performance is equally as impressive, thanks to the new Studio Colour HCX processor and its use of 3D LUTs. These allow the TV to deliver incredibly accurate colours that are fully saturated from the darkest parts of the image, all the way up to the brightest. There are extensive calibration controls, but those looking for an accurate picture will be glad to know the FZ802/FZ800 hits the industry targets right out of the box. This combination of contrast and colour performance results in some of the best images we've seen, and since Hollywood actually uses Panasonic OLED TVs in their post-production facilities, you can feel safe in the knowledge that you really are seeing exactly what the filmmakers want you to see. Or at least you are as long as you use the correct picture mode. The TV ships in Normal, which will probably be fine for most people with its saturated colours, higher brightness and increased processing. However, if image fidelity is important to you, then go with the THX modes and switch between the Cinema (night) and Bright Room (day) settings. When watching SDR (standard dynamic range)content, the contrast performance is superb thanks to those deep blacks and a suitably bright picture. The saturated but accurate colours give images real punch, while the addition of first-class processing means HD broadcasts and Blu-rays appear fantastic. The FZ802's pictures with HDR are equally as impressive, with the increased resolution taking full advantage of the 4K panel. An Ultra HD Blu-ray like Passengers (which is native 4K) reveals a staggering level of detail, while the HXC processor ensures highly accurate colours. The TV's ability to render details in the darker parts of the image really opens up the lower part of the dynamic range, resulting in perfectly defined stars in the space shots of Passengers. OLEDs might not be as bright as LCD TVs, but their ability to highlight individual stars which are only a few pixels wide shows off the self-emissive technology's key strength. The addition of the Dynamic Scene Optimiser also helps, as this analyses an HDR10 image and adjusts the tone mapping on a scene-by-scene basis, optimising the image for the OLED panel. This feature essentially mimics the way that dynamic metadata behaves, and certainly helps with more challenging HDR material. It also works without causing any clipping to the brightest scenes. The FZ802 supports all the main video streaming services, so you can watch Netflix, Amazon and YouTube in HDR10. It delivers some lovely images from these services, handling the BBC's UHD HLG World Cup trials very well, too. HLG really helps with football because the wider dynamic range means the camera operator doesn't have to open and close the camera lens as the action moves between dark and bright parts of the pitch. As with all OLED TVs, the HDR peak brightness is limited compared to competing LCD panels. The FZ802 can only deliver around 750nits on a 10 per cent window, although it can hit 900nits when dealing with very small areas of brightness. An OLED panel will also struggle to light the whole screen, which is something that doesn't bother an LCD TV. However, the deep blacks and pixel-level precision go a long way towards mitigating these limitations. As mentioned earlier, this Panasonic does not support Dolby Vision, although how big an omission this is will depend on whether you feel the format has legs. It's certainly got a lead over HDR10+, with Dolby Vision available on Netflix and iTunes globally, Amazon and Vudu in the US, and on numerous 4K Blu-rays, while only Amazon currently uses HDR10+. Although the FZ802/FZ800 has four HDMI inputs, only two are are full bandwidth, with the other two able to support 4K/60p but with the chroma capped at 4:2:0. What this means in practice is that on HDMI 3 and 4, if you're playing a 4K/60p game or watching 4K/50p via Sky Q, you'll be restricted to 8-bit rather than 10-bit video colour. Finally, OLED is a self-emissive technology, which is why it can deliver those incredibly deep blacks and pixel-level precision. This also means the FZ802 could theoretically suffer from image retention or screen burn. Although Panasonic has taken measures to mitigate the risk, it's worth bearing in mind, particularly if you game for long periods of time. Panasonic's Smart TV platform is based around the relatively simple My Home Screen system. Now in its third-generation, it remains essentially the same as the Firefox operating system on which it was originally based. However, while this smart platform might not be as sophisticated as much of the competition, there are quite a few benefits to keeping things simple. For a start My Home Screen is extremely intuitive to use, and when you press the Home button on the remote you get a choice of Live TV, Apps, and Devices. The titles are self explanatory, and having all the Apps in a single location makes them easy to find. You can also pin your favourite apps to the Home page, making it even easier to access the most frequently used ones. In terms of the available apps there's Freeview Play, which provides access to all the UK catch-up services including BBC iPlayer, ITVhub, All4, My5, BBC News & Sport and UK Play. There's also Netflix, Amazon and YouTube, along with Rakuten and Chili Cinema; so Now TV is the only major streaming service missing. The included remote is a bit on the plastic side, too, with large buttons that although clearly identified, aren't always laid out in a very logical manner. There are direct access buttons for Netflix and Freeview Play, though, and you can allocate one of your other most frequently used apps to the My App button. The Panasonic FZ802 is something of a surprise in the audio department, delivering a decent level of sound quality. The solid construction probably helps to a degree, but Panasonic has also crammed quite a few speakers and plenty of amplification into this slim chassis. There are four drivers built into the bottom of the TV, creating a 2.2-channel speaker system that is powered by 40W of amplification. The resulting sound system certainly packs a wallop. Despite the drivers being downward-firing, the resulting soundstage is very open and wide with a good sense of stereo separation. The TV can be turned up quite loud without becoming harsh or brittle, which is handy for blasting out those special movie nights. The mid-range is well defined, which ensures dialogue is always clear, while the higher frequencies are also nicely represented, making the FZ802 surprisingly good with music too. There's even a solid bass presence that supports the overall soundstage, giving more dynamic soundtracks greater impact. Although the FZ802 sounds good for a modern slimline TV, if audio quality is important to you then you might want to consider the FZ952/FZ950, which has a built-in Dynamic Blade soundbar that's tuned by Technics. Panasonic's 2018 mid-range OLED TV is an excellent addition to its current line-up; it consolidates what the company does best, while adding some exciting new features, and does so at a very competitive price. The latest version of Panasonic's Studio Colour HXC processor delivers a level of image accuracy that is truly impressive, with beautifully defined colours and plenty of details in the shadows. The image processing is equally as good, while the addition of the Dynamic Scene Optimiser feature helps boost the HDR performance. Its design might not be flashy but it's well made, and sounds surprisingly good for an ultra slim TV. The smart platform is simple but effective, and the FZ802's only real issue is the lack of Dolby Vision support. When you take everything into account, you'll be hard pushed to find a better OLED TV for the money. The LG C8 might be a flashier looking temptation, but it's also pricier, which puts Panasonic in a very strong position indeed. It might be more expensive but this is most complete TV currently on the market. It has a fantastic picture, a state-of-the-art smart platform, a gorgeous design and it even sounds good. It not only supports Dolby Vision but also Dolby Atmos, and it is capable of a level of accuracy that can challenge even this Panasonic OLED. This OLED TV is a bit more expensive but offers a superb picture, supports Dolby Vision and incorporates the company's Acoustic Surface technology that uses the screen as a speaker. However, Sony's use of the Android smart platform might be off-putting because although the Panasonic system is simple, at least it doesn't crash.